A lot of our clients have their receptions in the grand hotels of New York City. The Plaza, The New York Palace and The St. Regis are to name a few that we bring wedding cakes to each week. All of these beautiful ballrooms have the most gorgeous gilded details. We have a lot of clients that love to be inspired by these kinds of details from architecture and see them on their cakes. The intricate detail of our molds looks beautiful in an antique gold or silver color. Gold and silver details are beautiful on any cake - but don't be afraid to try something new! When we met with our bride Molly, who was having her reception at The New York Palace, she loved the architectural details in the building. Molly and her fiancé decided on a more intimate party for their reception and there was no need for a very large cake. Although they loved the gilding in the building, Molly felt that it might be a little to “heavy” on her wedding cake to have antique gold details. Try white pearl shimmer for a more fresh and modern take on the old classic. So rather than using gold or silver, we changed it up a bit and used white pearl shimmer. The shimmer brings out all of the details on the molds but still maintains that “old world” style. This freshens up the cake giving it more of a modern twist. 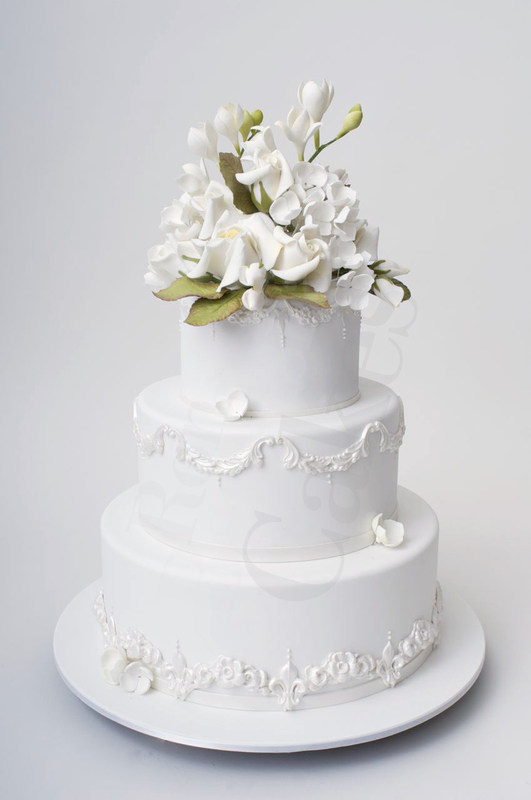 Ron suggested the sugar flower topper so the white shimmery details can be featured. He added a few hydrangea blossoms to the cake ledges and tray to complete the design. Hi Rebeca, I´m from Mexico an love Ron cakes, I have a question, what kind of gold and silver dust color does Ron recommend in order to achieve that shinny pieces? Where can I get these molds? Love thwm.